In the administrative web portal, you can use the Accounts tab to manage and support user accounts. In some instances, you might need to resend a user's password, or manually deliver a user's welcome email. Welcome emails typically include user credentials, a link to the web portal, and links to download apps and devices. Note: For information on customizing welcome emails, please reference the Customizing Email Templates Knowledgebase article. In the Organization navigation menu, select the organization to which the user account belongs. The selected organization displays. Click the Accounts tab. The Accounts page displays, showing a list of all user accounts in the selected organization. In the Accounts page toolbar, you can search for individual user accounts using the Search field. Click the checkbox next to the appropriate user account. You can optionally select more than one user at a time. Click the Send Message button. An Email Users dialog box displays. Use this form to communicate with the selected user account(s). Click the Send Reset Password Link checkbox to resend the selected user’s password. 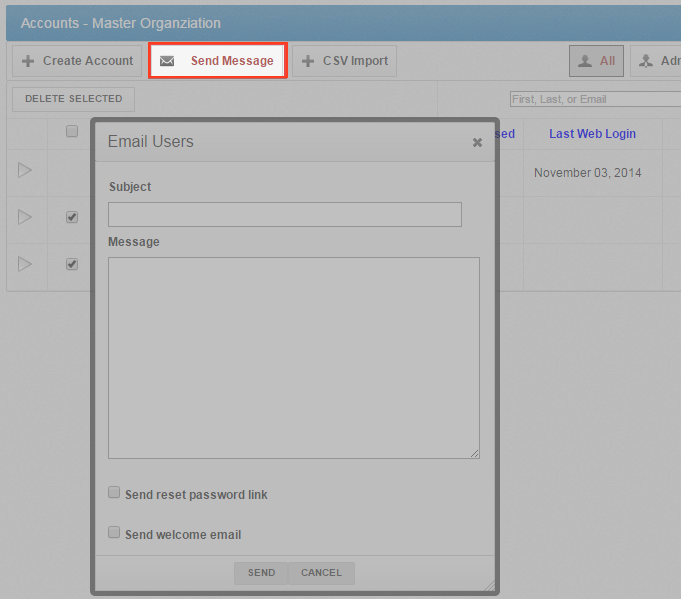 Click the Send Welcome Email checkbox to resend a welcome email to the selected user. Note: User accounts that have been imported by an authentication source, such as Active Directory, should be managed within the original source. For more information, please reference the Active Directory Integration Knowledgebase article. Click the Send button when you are finished.